In the book, Mullins explores five approaches that 21st century entrepreneurs have adapted from their predecessors to finance the start or growth of their businesses using the customer’s, rather than investor’s, cash. Mullins stresses that for most companies, fast-growing or otherwise, the early funding comes from a source that is much more agreeable and hospitable than investors, their customers, something Michael Dell, Bill Gates and Banana Republic’s Mel and Patricia Ziegler did to get their companies up and running and turn them into iconic brands. The book features a case study showcasing the business model transformation and ensuing success of Puerto Rico-based Rock Solid Technologies. Mullins met the Rock Solid team as participants in the first edition of the Guayacán Venture Accelerator in 2010. “Dr. John Mullins of the London Business School was an important catalyst in the evolution of our company. He encouraged us to explore international markets and focus on our products. John has been a teacher, mentor and friend to our company. We congratulate him on his new book and we are honored to be part of it,” said Ángel Pérez, vice-president of Rock Solid Technologies. John Mullins is the best-selling author of two previous books targeted at entrepreneurs and angel investors. He is an Associate Professor of Management Practice in Marketing and Entrepreneurship at the London Business School. 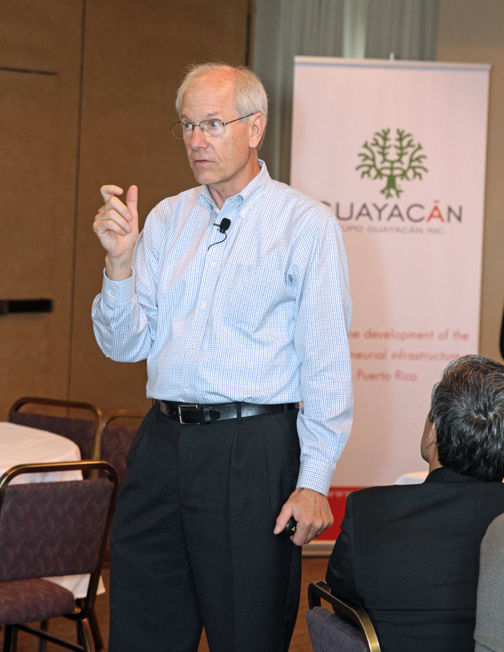 Since 2010 Professor Mullins has served as speaker and instructor for the Guayacán Venture Accelerator, an entrepreneurial development program offered by Grupo Guayacán designed to rapidly propel the growth of mature companies. USDA opens dairy farm risk management program to P.R. Hey Buddy!, I found this information for you: "Guayacán hosts book signing event with John Mullins". Here is the website link: https://newsismybusiness.com/guayacan-signing-mullins/. Thank you.